On a recent layover at Baltimore Washington International Airport, I was dashing to my gate when I realized I was starving. Having been on two airplanes for five hours at that point, and having been fed a grand total of two packets of peanuts, some animal crackers and less than a full can of Diet Coke, my hunger pangs were not surprising. 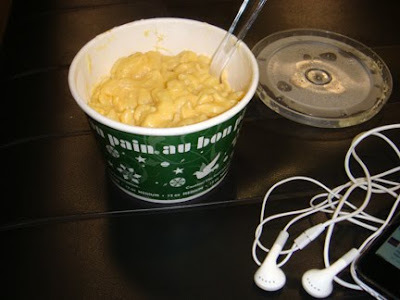 The mac and cheese at Au Bon Pain, however, was a surprise. The line was long and my time was short, so I intended to grab a pint of self-service soup there. Imagine my surprise when I noticed that the sign on one of the “kettles” said it contained macaroni and cheese. I thought, “Mac and cheese soup?” and cautiously opened the lid. But no: it wasn’t soup, it was mac and cheese. Or a reasonable facsimile thereof. And it was reasonable, I must say. Sure, the noodles were in a sorry state in terms of texture. Who knows how long they’d been holding in the constant heat of that electric soup kettle? These elbows were well past al dente, I’ll grant you. But they were enrobed in a sauce that honestly wasn’t half bad. The overall dish was gummy but the sauce itself was savory and velvety, with distinct flavors of Cheddar and nutmeg. Oh, and a ton of salt, as I learned when I looked it up later. No wonder my ankles were so swollen on that trip (I blamed it on the time spent at altitude but now I know better). By the time I reached the cashier, my flight was boarding so I stowed the mac in my carry-on and didn’t actually eat it until we were airborne again, probably a good forty minutes later. And I’m sure that didn’t help with the texture issues! But the nutmeg fragrance was agreeable and I appreciated the mac’s silky warmth as the plane surged into the night. All things considered, I can’t heartily endorse the Au Bon Pain mac and cheese. But I do give it props for attempting to have a genuine flavor personality, and for being there for me when I needed a friend at BWI, midway through a grueling day of traveling. A bond pass is issued for the notified position for the people. The engagement of the passé and ukwritings.com reviews is fully empowered for the movement of the right and effective means for the humans in life.